North African Cinema is not thriving in America: Berber cinema even less. This may be at least one reason enough for film, history, and culture buffs to jump on this opportunity to discover a 1870’s North Africa community’s troubles as they are driven away from their land. 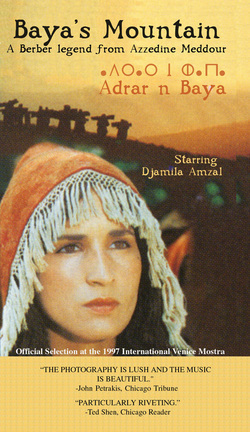 The story is that of Baya (played by Djamila Amzal), an Amazigh (Berber) legendary beauty and follows a small Berber community as their attempt to survive after their land, lost in the war against the French, becomes the property of a feudal lord. In the Atlas Mountains of Kabylia in French-occupied Algeria, located about 70 miles from Algiers, the capital, Baya’s husband is killed by the son of the local feudal lord. Gold coins offered as blood money become the envy of her community members who pressure Baya to use it as a war tax to get back their land. Having refused their requested, she is shunned by most members of her community, but still decides to follow her community and focus on rearing her son. As community is indeed challenged to choose between survival and honor, Baya does not tell of her plan, and her rebellion against the injustice of the feudal lord. Her own community does not seem to understand her pain. The movie is indeed filled with symbols: To mourn her husband’s death, Baya lit a fire and painstakingly darkens her hand mirror with smoke, hiding her beauty from her own eyes. The legendary beautiful girl of Anzar, the God of rain is told. Having succeeded in planting wheat, the community is further challenged by the lack of rain. A plea for rain is then organized with children running to look for the rainbow, evidence of rain, Baya is dressed in a beautifully decorated while robe, and silver jewelry adorning her head and hands, is walked in a procession by the women. Said (the villain), her husband’s killer, succeeds in kidnapping her and offers her a life of plenty and a way out of misery. Baya refused and uses cow dung to get herself out of the unfortunate encounter. Luckily, Djendel, a community outlaw sought by the feudal lord, comes to her rescue. With no land to farm, this small community is forced to find refuge in the high mountains. Farming the rocky and chalky earth is a challenge that the community members must overcome to survive. The plot is most riveting as the community struggles to survive and disputes frequently erupt among the members. The successful farming solution is beautifully photographed in a most fascinating scenery of multitude lights moving uphill and downhill at night, portraying the community’s impressive determination to survive. The Berbers are the first inhabitants of North Africa. The region had been invaded successively by the Phoenicians, the Romans, the Vandals, the Byzantines, the Arabs, the Turks, the Spaniards, and finally the French in 1830. Today, although the North African countries have gained independence from France, the Berbers also known as Imazighen are still peacefully fighting and claiming the rights to their language, culture, and identity despite pro-Arab North African governments’ policies built on cultural apartheid. The making of Baya’s Mountain was not without obstacles. One Algerian Minister saw it as a threat to the Algerian nation because it was being made in the Berber language. In addition, thirteen crewmembers died when an explosion of mysterious origin occurred at the film location during the film shooting. After viewing this movie, you will learn that, in addition to the fact that Africa is not only the cradle of humanity, cheerleading, a sport and cultural activity dear to Americans, seems to have originated in North Africa, just like Berber carpets. One difference, instead of cheering sports players, Berber women cheered their husbands and brothers during gun battles. Baya’s Mountain does not have a happy ending. Life does not always. Still, this movie deserves to be seen for its beautiful photography and magnificent legend. Director: Azzedine Meddour with Djamila Amzal, Abderrahmane Debiane, Ali Ighil Ali.